Credit union loan balances broke the $1 trillion mark in March, doubling the $500 billion milestone set in August 2006. Jobs growth jumped up from 155,000 in March to 244,000 in May, according to preliminary employment data from the U.S. Bureau of Labor Statistics. Plus, credit unions have continued offering low loan interest rates and fees, passing on savings from their nonprofit status. 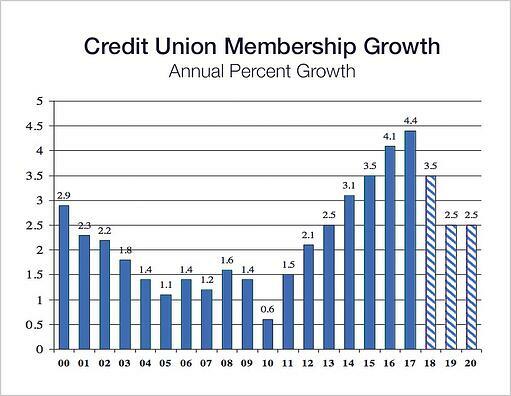 As a result of this perfect storm, credit union memberships grew at the fastest pace in the modern credit union era from January to April 2018. “Memberships are up 4.5% [so far] during the past year due to robust demand for credit, solid job growth, and credit unions having comparatively lower fees and loan interest rates,” according to the latest Credit Union Trends Report, authored by Steven Rick of CUNA Mutual Group. Rick conservatively predicts credit union membership growth to exceed 3.5 percent for the full year, trending down from the 4.4 percent rate for 2017 yet still above annual growth rates measured between 2000 and 2014. U.S. gross domestic product (GDP) growth over the next two years should support continued credit union lending and membership expansion, according to Rick. The second quarter of 2018 saw GDP growth at nearly 4 percent, up from 2 percent in the first quarter, according to estimates from Kiplinger. Annual growth is expected to increase 2.9 percent for the year, up from 2017’s 2.3 percent. Predictions for consumer spending through the remainder of 2018 are mixed. Kiplinger predicts spending for the rest of 2018 to be up by 3 percent or higher, and forecasts business spending to be up 7 percent in 2018 due to expanded tax breaks. Despite consumer confidence being at a 17-year high, Cox Automotive’s July 2018 Industry Update predicts slight consumer spending reductions, specifically on housing and vehicles. New car sales volume increased 5 percent year over year in July, according to Cox. As long-term growth continues, Cox predicts new car sales to come in at approximately 16.9 million—a healthy rate, but also under the 17 million SAAR, indicating vehicle sales growth slowing. Single-family home construction was up this past spring, indicating a solid year for the residential real estate market, Kiplinger reports. Increased wealth and home values encourage customers to spend a little more, but spending could balance out with fluctuations in the stock market. Both Cox and Kiplinger expect the Federal Reserve to raise interest rates twice more in 2018, which could negatively impact credit availability. Positive economic data from the first half of the year, in the form of higher wages, growing household income, job gains, and credit utilization, may put credit unions in a position to tackle digital transformation now. There are several digital transformation trends credit unions are pursuing to address increased competition from new market entrants, respond to rapidly changing consumer behaviors and expectations, and preserve their value. Let’s explore three key digital transformation trends that top credit unions are pursuing in 2018. By 2020, payments in the U.S. must happen faster. That’s according to the Federal Reserve’s Faster Payments Task Force, which established a short-term working group in 2017 called the Governance Framework Formation Team (GFFT) to develop a framework for facilitating interoperability and thus creating ubiquitous, faster payments. In April of this year, GFFT released a draft operating vision for the U.S. Faster Payments Council (FPC), to be tasked with designing and executing a faster payments roadmap for the U.S. The FPC could be the biggest change to the U.S. payment system since the National Automated Clearinghouse Association (NACHA) was formed in 1974 to govern electronic payments. 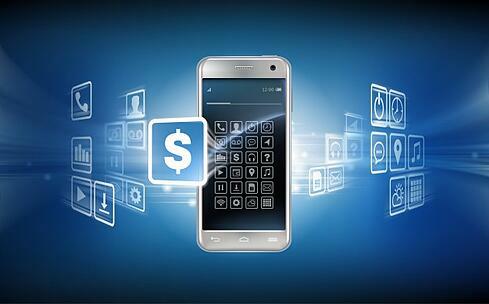 Credit unions must prepare for faster/real-time payments. Credit unions and other financial institutions weighed in during the 60-day comment period, which ended June 22. GFFT is planning to compile the vast number of inputs for a report to be released later this summer. In the meantime, credit unions are continuing to respond to growing expectations for faster payments. Though large banks and financial institutions are driving the transition, credit unions are finding that strategic fintech partnerships can provide faster, cost-effective payment solutions for their members. Through strategic partnerships, credit unions can optimize their digital strategies and deliver services that today’s members expect. CheckAlt is helping credit unions by providing solutions that address their digital transformation challenges. According to data from the annual Callahan Credit Union Directory, credit unions across the country are increasing their focus on online and mobile services. Yet 35.4 percent of credit unions were found to not offer online bill pay for their members. With new car sales and housing construction on the rise comes increased demand for auto and mortgage loans, which in turn may result in more paper payments for credit unions to juggle. CheckAlt’s LoanPay online bill pay solution is helping credit union members pay their loans without the hassle of checks and stamps. With LoanPay, credit unions can offer their members faster payments, using any method from any checking account, including echecks. 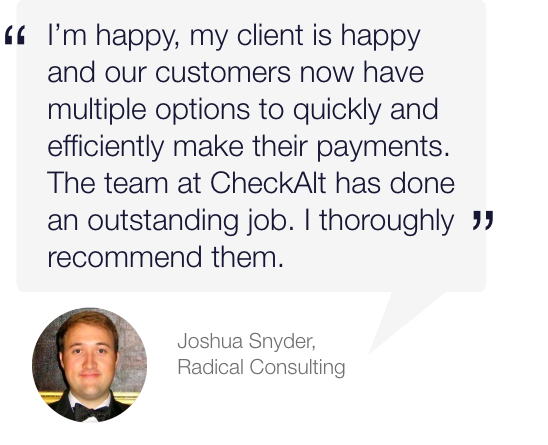 Credit unions are using CheckAlt's loan payment processing solution. 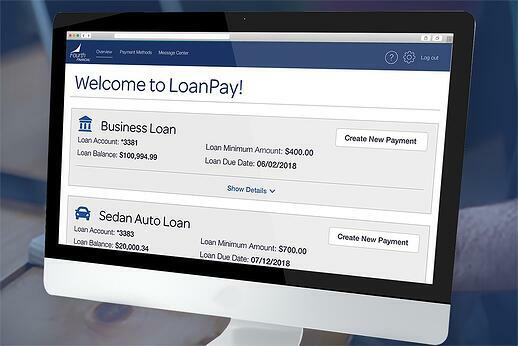 Members simply sign on to their credit union’s online banking portal to access LoanPay or click a link from the credit union’s website to a custom-branded LoanPay portal, to access all of their loans in real time. Payments may be scheduled based on loan type, from auto loans to mortgages, business loans, and even commercial real estate loans. Using fintech solutions like CheckAlt’s LoanPay, credit unions have access to more data. LoanPay allows users to easily export detailed data reports as Excel, CSV, or PDF files for analysis. More credit unions are realizing the value of creating a data strategy for how they market new products and services to their members. Improving performance is a meaningful reason to pursue data analytics, and performance is directly tied to member retention. Big banks have taken advantage of “Big Data” to better understand their customers, and to make decisions on how to position their organizations and services for the future. But data analytics isn’t just for large institutions anymore. With increased adoption of online bill pay, credit unions have more valuable data points to analyze than ever before. Data points must be chosen carefully to align with high-value activities. For example, loan repayment data points like payment method and channel, loan type, payment date, and payment history can help a credit union more accurately pinpoint a member’s future needs. 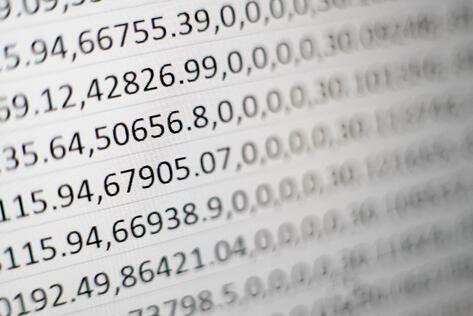 Improving performance is a meaningful reason to pursue data analytics. Few credit unions take the time to contextualize how many of their current members are using just one of the credit unions services. Identifying the number of single-service members—such as those who only have an auto loan with the credit union—is just the first step. Analyzing those members’ transaction history, including online bill payments, can allow a credit union to understand incoming deposits and outbound payments going to other financial institutions. These members are at least tempted to explore services provided to other institutions. Some of them may have already taken steps to exit the credit union. Data analytics lets credit unions quickly identify problems and their severity, then make better choices in how they retain and ideally expand these member relationships. Is your credit union ready to implement faster payment solutions that provide you actionable data to improve member relationships? Contact CheckAlt to learn how our suite of payment solutions can help fulfill your members’ needs.